Lance and Ursula Clayton, owners of eight|11 place are at it again, bringing a little extra vibe to downtown Frisco with the launch of their newest restaurant, 5th Oak Pizza & Beer. Our favorite neighborhood couple have teamed up with Ana Luisa Fuentes (Ursula’s mom), to present the new concept and are getting ready for a late summer opening! Nestled on the corner of 5th & Oak streets in Frisco’s Old Town Commercial district, this charming family are excited to present another trendy spot to the up and coming urban neighborhood. As for the beer that will be local too, rotating taps sold by the glass or growler. There will be some differences from eight/11…. you can expect to see a TV or two. Perhaps a Jukebox and some walk up windows for beer and food pickup. They don’t plan on hiring any wait staff, just your bartender and foodies! Hours have yet to be determined but will be consistent with other bars/restaurants in the area. We are beyond excited at Lifestyle Frisco for this new venture and for a great team. Keep your eyes open for additional information and dates! Frisco Freedom Fest 2015 is coming Friday, the 3rd, through Saturday, July 4th. The event will feature a ton of attractions, vendors, and events in and around Frisco Square. Here are the highlights and things you should know. On Friday, July 3 the Hotter ‘n Firecrackers 5k run will start at 9pm with road closures in the area around Frisco Square. Frisco Freedom fest kicks off on Saturday, July 4th at 4:00pm. Taste of Frisco runs from 4pm until fireworks begin. At 8pm the FC Dallas take on the New England Revolution. Fireworks will begin at approximately 1o:20pm and are launched from the north field of Toyota Stadium. 2015 attractions include a Children’s Expo, fireworks, Taste of Frisco, live music on the community stage, party in the plaza, patriotic vendor village, and more. The individual events at the Children’s Expo each have an associated cost. On Friday, July 3, additional roads will be closed at 7 pm to accommodate the 5K race. On Saturday, July 4, Coleman Boulevard will be closed starting at 2 pm on Saturday and will remain closed for the rest of the day. Frisco Street will be closed between Main Street and Technology Drive from approximately 9:30pm to 10:30pm for the fireworks show. After the fireworks, northbound Frisco Street will reopen, but southbound Frisco Street will remain closed until midnight. Eastbound Main Street and eastbound Cotton Gin Road — between Legacy Drive and Dallas Parkway — will be closed at 10 pm in order to move traffic more efficiently out of Toyota Stadium and Frisco Square following the festival and fireworks. Get all of the details on parking and road closures. Legacy ER (map): Take Main Street 1 mile west of Toyota Stadium. Take a right on Legacy and Legacy ER will be on your left. Concentra Urgent Care (map): Take Main Street 1.5 – 2 miles west of Toyota Stadium, in the Kroger parking strip mall north of the grocery store. Baylor Medical Center at Frisco (map): Open 24hrs, Emergeny Room. Dallas Tollroad south to Warren Parkway. Left on Warren, Baylor will be about 1 mile in on your left. Get all of the details for Frisco Freedom Fest on the official site. We’ve got a sports Celebrity Baseball Game, a state of Frisco luncheon, Park-A-Palooza, story-time, and you and your kids can learn new cooking skills. Lots of events where you can be indoors or outside in Frisco! It’s the last week for Music In the Square. We’ll be rounding it out with music from country singer Justin Mason on the green in Frisco Square. Whether you’ve hit them all or yet to make it to one, don’t miss this weekends concert and your last chance in 2015 to hear great music in a fun, family-friendly, outdoor environment. “State of the City Luncheon – A Conversation with George Purefoy” – From 11:30 AM – 1:00 PM in Embassy Suites Dallas-Frisco Hotel, Conference Center & Spa, 7600 John Q. Hammons Drive, this year’s State of the City Luncheon will feature Frisco’s very own long-time City Manager, George Purefoy. This will a rare opportunity to review the vision, current state and future of Frisco. Attendees will also hear updates from Mayor Maher Maso and FEDC President, Jim Gandy. We will complete the luncheon honoring the Leadership Frisco Class XVIII as they graduate! This is an exciting time for Leadership Frisco – Come Learn More about Leadership Frisco and celebrate with LF Class XVIII! “CCBA Hosts Annual Mayoral Summit” – The Collin County Business Alliance (CCBA) will host its annual Mayoral Summit featuring keynote speaker William D. Eggers, author of The Solution Revolution, a six-person mayoral panel discussion and business-government round tables. CCBA brings together a unique platform for elected officials and local government representatives from across the region to discuss priorities and solutions to challenges facing the growth and prosperity of Collin County. The panel will include: Stephen Terrell, Allen; Maher Maso, Frisco; Brian Loughmiller, McKinney; Harry LaRosiliere, Plano; Paul Voelker, Richardson; and Eric Hogue, Wylie. Registration opens at 9:30 a.m. and the summit begins at 10:00 a.m. with opening remarks and roundtable sessions focused on discussions about providing transportation and water infrastructure as well as preparing the business and community leaders of tomorrow. The keynote and mayoral panel begin at 11:30 a.m. – 1:30 p.m. and will be held at the Capital One Conference Center in Plano located at 8036 Dominion Parkway. Lunch will be provided and a complimentary signed copy of The Solution Revolution will be available after the program. “FC Dallas vs Houston Dynamo” – Match starts at 8pm, with gates opening 60 minutes prior to match time. Children two years or older must have a ticket for admittance. Children under two must sit on a parent or guardian’s lap. “AMERICAN GIRL EVENT: BAKING WITH GRACE” – At this Williams Sonoma Junior Cooking Class, guests are invited to join Williams-Sonoma and American Girl® for a hands-on baking class inspired by Grace™ – the 2015 Girl of the Year™. Each student will learn Grace’s favorite French Madeleine recipe, then finish the pastries with dark chocolate, white chocolate and a few other toppings. The class will also make and decorate sugar cookies from scratch. Each child will take home a special American Girl® goodie bag. Suitable for ages 8 to 12. Class is $30 per child. Call Williams-Sonoma at (972) 712-9455 to register. Class limited to 12 students. Reservations are required at (972) 712-9455 or stop by Williams-Sonoma, located on the lower level near the main entrance to Stonebriar mall. An adult must remain with the child during the classes. Participants enjoy 10% savings on select same-day store purchases. Individuals who wish to attend are asked to make a reservation by the Thursday before the Saturday class. For reservations, call (972) 712-9455 or stop by Williams-Sonoma, located on the lower level near the main entrance to Stonebriar mall. “Dirk Nowitzki Heroes Celebrity Baseball Game” – 4:45 p.m. – The Heroes Special Olympics All-Star Softball Game; 6:30 p.m. – DIRK NOWITZKI’S 2015 HEROES CELEBRITY BASEBALL GAME and FIREWORKS FINALE presented by Baylor Medical Center at Frisco. From Mavericks to Cowboys and more, famous faces will include Dirk Nowitzki (Dallas Mavericks MVP and 2011 NBA champion), Charles Barkley (NBA Hall of Famer and TV analyst), Dez Bryant (Dallas Cowboys wide receiver), Cole Beasley (Dallas Cowboys wide receiver), Terrance Williams (Dallas Cowboys wide receiver), J. J. Wilcox (Dallas Cowboys safety), Jack Crawford (Dallas Cowboys defensive end), Tyron Smith (Dallas Cowboys offensive tackle), Brian Cardinal (former Dallas Mavericks forward and 2011 NBA champion), Monta Ellis (Dallas Mavericks guard), Devin Harris (Dallas Mavericks guard), Charlie Villanueva (Dallas Mavericks forward), Ryan Cabrera (pop/rock singer and Dallas native) plus more names to come. Chandler Parsons (Dallas Mavericks forward) will be a team manager. Note: Roster subject to change. Tickets are on sale now for $8, $12, $16 and $19 at Ticketmaster (800-745-3000 or ticketmaster.com) or at the Dr Pepper Ballpark Box Office during office hours. Will call will open at 10 a.m. on June 27. Tickets also will be available at the door. Last year’s event was a sell-out, so advance purchase is recommended. “Park-A-Palooza” – From 7-11pm in Warren Sports Complex, bring your lawn chairs and blankets, pack your picnic, and watch the PG-rated movie Paddington in the park with family and friends. At this FREE event, kids can work off their energy in the bounce houses before the movie begins at sunset. 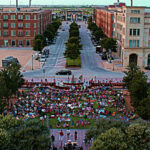 “Music in the Square” – Every Saturday evening in June, join us on the Simpson Plaza lawn, in front of City Hall for Frisco Square’s featured summer event, MUSIC IN THE SQUARE. Bring friends and family, grab a picnic, some blankets or chairs, and under the nighttime stars, enjoy listening to a unique line-up of talented musicians between 7:30 and 9:00 PM. Admission is free. “2015 Frisco Farmers Market” – Starting at 8am in Frisco Square, a bounty of fresh fruits and vegetables creates a colorful welcome to those who appreciate the “buy fresh, buy local” idea. Seasonal fruits create a spectacular palette! The freshest vegetables in North Dallas will excite your culinary talents! Also available are pasture fed beef, pork, lamb, and the freshest eggs you’ll find. Buy pasta, seafood, cheesecake, muffins, gourmet items, and honey—all fresh! “FOURTH OF JULY COOKOUT – Williams Sonoma Complimentary Cooking Class” – A red, white and blue motif pairs perfectly with a menu of all-American foods cooked on the grill and ultra-creative desserts in star-spangled colors. The menu is wonderful for sharing with family and friends. Participants enjoy 10% savings on select same-day store purchases. Individuals who wish to attend are asked to make a reservation by the Thursday before the Saturday class. For reservations, call (972) 712-9455 or stop by Williams-Sonoma, located on the lower level near the main entrance to Stonebriar mall. “Children’s Story Time – Pottery Barn Kids, Stonebriar” – Children invited for Story Time every Tuesday in June at 11 a.m. The cool, out-of-the-sun sessions are set for June 2, 9, 16, 23 and 30. At their first Story Time, children will receive an official Book Club Card. The Card is stamped for each attendance. When the Card has five stamps, the child will receive a special gift. Story Time is presented compliments of Pottery Barn Kids and reservations are not required. A parent/caregiver is required to remain. Pottery Barn Kids is on the upper level near the Food Court. Frisco Freedom Fest: July 3 & 4. It’s a 2 day celebration of our nations independence with loads of attractions, sports, a 5k run, live music, food, and of course, fireworks! $20 – Evening Shows; $19 – Matinees (Discounts for Seniors (60+), Students, & Millitary) ***1.50 charge per ticket if paying by credit card. For more information, email fct@flash.net or call 972-370-2266. July 24th-25th– Double-Feature of “Ruthless!” By Joel Paley and “Almost, Maine” by John Cariani– Black Box Theater – Join Squee Productions on July 24th-25th for two fantastic plays. At 7:00 p.m. you can catch “Ruthless!” the campy story of an 8-year old who will do anything to get a role in her school play. Or, stick around until 8:00 for “Almost, Maine”, the tale of lost love and gained in a secluded town. General Admission to both plays: $5 Questions? Email brian@squee.us. July 2nd–August 9th “ARTrageous” VAGF Art Exhibition, Frisco Art Gallery – The Visual Arts Guild of Frisco will host an open art show for members and non-members this summer in the Frisco Art Gallery at Frisco’s Discovery Center. Come during regular business hours to view art of all mediums and genres from local artists. Questions? Contact VAGF President, Brenda Thomas at brenda.g.thomas@gmail.com. Closing Reception on August 9th from 3-5 pm in Frisco Art Gallery. Now that Joey Gallo and Chi Chi Gonzalez have made their major league debuts with the Texas Rangers this season, joining Ryan Rua, Alex Claudio and Keone Kela, it leads you to wonder what top prospects will be the next to jump from Double-A to the big leagues. Here’s a look at three players that definitely deserve your attention. Depsite being the youngest player on this list (20), Mazara signed his professional contract while Nick Williams and Jake Thompson were still in high school. At the time, the $4.95 million bonus he signed was the richest ever awarded to an international amateur. And from what Mazara has done at Double-A Frisco, that gargantuan bonus might be a steal of a deal. 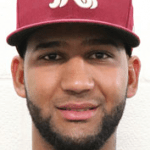 Early on in his career, Mazara incorporated a large leg kick that slowed down his hands and compromised his ability to utilize his freakish bat speed. Now that this subtle flaw has been erased, Mazara is putting on quite a display with his plus-power. Aside from being blocked by a formidable group of outfielders in the big leagues, Mazara needs to work on his plate discipline to help cut down on his strikeouts. A below-average runner, his arm is plus and makes him more than suitable for a corner outfield position. Nick Williams is a living embodiment of the type of position players the Rangers like to draft during the Jon Daniels era—super athletic and toolsy with high ceilings, but very raw in terms of baseball knowledge and practical implementation. Taken in the second round of the 2012 MLB Draft, Williams, like Jake Thompson is a native Texan. Williams, from Galveston’s Ball High, is a physical specimen that some have compared to a young Ken Griffey Jr. The talent is definitely there, it’s just a matter of if he can segue from promising prospect to big league producer. Williams is an excellent runner but has not been able to utilize this tool as a professional due to poor reads on the basepaths. His arm is plenty strong enough for right field, but he likely projects as a left fielder. Williams, like Joey Gallo before him, has a tremendous amount of raw power, but needs to work the count better and enhance his pitch awareness so as to maximize his power. With a bevy of outfield talent both in the minors and on the Rangers’ roster, Williams’ ETA might be as late as 2016, but something will have to give first—i.e. a trade of Choo or Hamilton or a subsequent injury—and he may find himself as potential trade bait. The big (6’4”, 235 lb) right-hander was the top pick in the second round of 2012 by the Detroit Tigers. Thompson came to the Rangers via a trade with the Tigers during last summer’s MLB Trade Deadline. 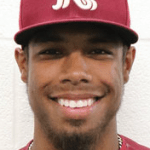 The Tigers received Joaquin Soria with the Rangers netting Thompson, who graduated from Rockwall-Heath High School, less than an hour’s drive from Frisco’s Dr. Pepper Ballpark. Of the three prospects, Thompson is the most likely for a 2015 call-up, since the Texas Rangers are outfield-heavy, and lack depth in the bullpen. He could slide into the bullpen or be slotted in the rotation should another injury ensue. Just 21 years old, Thompson had success at Double-A last season, as he went 1-0 with a 2.45 ERA for the Lake Erie SeaWolves before finishing the year with the RoughRiders, where he finished up the season strong, going 3-1 with a 3.28 ERA. Thompson projects as a solid number three starter with his two plus-pitches, a fastball that touches the mid-to-upper 90s and a slider that is a true swing-and-miss offering. Thompson’s ceiling could reach as high as a number two starter, especially if he can master his above-average curveball and changeup. While many interior design styles exist, not everyone fits into just one category. More people are favoring an eclectic blend these days based on a collection of existing furniture and accessories. Those items may mix various styles and can combine to create aesthetic diversity in your space. As an interior designer, blending styles is where I find my greatest challenge and satisfaction. Combining what a client already has with accents such as waterstone faucets will create something new and exciting enabling us to create a unique style tailored to the individual. When I work with my clients, I draw inspiration from one or more of five different styles, incorporating elements of each to achieve the look and feel you want. One of the most important facets of traditional design is the silhouette or of the furnishings. Wing-backed chairs, claw-footed tables, and bow-legged furniture pieces are a few examples. Common models for traditional furniture are pieces attributed to the Queen Anne or Chippendale styles, and antiques are also often integrated into this design style. Though brimming with elegance, traditional design also tends to emphasize simplicity and comfort. Pairings of furniture and accessories are common in this design scheme creating a sense of symmetry around a focal point, such as a favorite work of art, a fireplace, or a large piece of furniture. Recognized by it’s strikingly beautiful style and clean, uncomplicated nature, a transitional design features furniture lines that are simple yet sophisticated with either straight lines or rounded profiles. Fabric is diverse as well with medium to large scale graphic patterns on overstuffed sofas or textured chenille on sleek wood frames. The transitional palette relies on a lack of color to evoke a serene atmosphere. Dark brown can add depth and balance to neutral colors such as tan and vanilla. We take a semi-minimalist approach with carefully selected accessories. These might include a potted orchid gracefully arching in front of a window, white mats that set off photographs in simple black and silver frames, or an oval wooden tray that provides a resting spot for similarly shaped silver candleholders. This kind of grouping provides a quiet punctuation to the furniture. De-emphasizing busy decoration keeps the focus on the simplicity and sophistication of the design. Interior design in the contemporary style provides a softened, rounded look to combat the stark lines of modernity. Soft contemporary interiors are characterized by neutral elements accentuated by bold color, or glamorous elements, such as beading and glass, but the focus is always the basics of line, shape and form. The typical contemporary color palette relies on brown, taupe, cream, and pure white while fabrics or accents are luxurious and tends to have a higher sheen. We also use dashes of bold color on single walls or incorporated within decorative accessories, such as artwork or decorations that tend toward the abstract like a bent piece of wood found in its natural state or crystal agates or geodes. Furniture is often shapely rather than angular and exhibits smooth surfaces and clean lines with minimal decoration. Case pieces (non-upholstered items) with minimal graining, such as maple and birch, and featuring satin, glass, high gloss finishes, stainless steel, or chrome finishes round out the look. Soft and supple leathers, low sheen velvets, or silks are often found adorning upholstered items. Bold colors – such as teal, fuchsia and emerald green – along with dynamic geometric patterns are common accents for interiors. The keywords for extreme contemporary style are bold, geometric, and original. Furniture and accessories may feature exaggerated linear features or unexpected geometry such as a chair shaped like a question mark or a circular bed. Interiors contain intense splashes of bold color – cobalt blues, reds, blacks and whites – while focusing on the basics of line, shape and form. Upholstery almost always includes leather and low-pile suede. Extreme contemporary design’s minimalistic nature emphasizes spacious rooms with a limited number intentional furniture pieces and details. The eye goes to each separate entity in a room and lingers there. Shape prevails over purpose and makes the most of shiny surfaces that might include high gloss lacquer, glass or acrylic encasements, and high sheen metals like chrome or high polished brass. Floors are usually solid in color with subtle, if any variation in their wood, stone or tile. Light fixtures may feature colored glass and/or high-polished metals. Any artwork present is large, usually abstract and exists in singular pieces rather than in multiples, to omit the cluttering effect that this style seeks to avoid. Industrial design is associated with an “urban loft” look. Often used in city apartments, modern homes and commercial spaces, this style showcases neutral tones, utilitarian objects, and lots of “worn in” wood and metal surfaces. This look combines an industrial feel with a range of other styles, from the earthy to the polished. It can include such elements as exposed ceilings, brick walls, lots of steel accents, metal to mimic steel bars or rebar, wood that may be raw or aged with metal accents attached, or even exposed pipes and ducts. In most suburban homes, these are features that people try to conceal, but it’s what the industrial design celebrates. Accessories can include exposed Edison bulbs and wire framed with no fabric. Colors are darker, and embrace ranges of navy blues, grays, browns and blacks while furniture upholstery is leather or a more visually rigid fabric. If you feel that your space needs to be defined by one specific style, consider this an encouragement to develop one of them or a nudge to embrace eclecticism and merge your favorite styles together! If it’s difficult to execute this on your own, a professional interior designer can create the perfect blend of your individual tastes and current décor with the appropriate balance of styles elements to represent you. Now go ahead; dare to think out of the box and show the world your most stylish self!